ABIT is well known for their highly tweakable BIOS. It was ABIT who introduced the jumperless board design and a made history with their SOFTMENU BIOS tweaking options. The IT7 Max 2 Award BIOS has all the usual options and functions - there is nothing much to mention about it. But what attracted our attention are some very specific options in the SOFTMENU part of the IT7 Max 2 BIOS. CPU:RAM ratio selectable at 4:3, 1:1, and to 3:4. These options make the IT7 Max 2 BIOS an overclocker’s dream. Setting the CPU:RAM ratio to 3:4, puts the FSB at 133 MHz and the RAM frequency at 177 MHz. That means: without overclocking the CPU and compromising stability it is possible to attain superb bandwidth, provided of course quality DDR RAM is at hand. And even better: the 3:4 gives enormous leverage when the FSB frequency is increased, because the RAM frequency goes up accordingly in a 3:4 ratio. God-sent is also the capability to fix the PCI bus frequency. This keeps PCI devices running at their stock frequency or intentionally slightly overclocked, just as the user wishes. With the PCI frequency fixed nobody needs to worry anymore about the dreaded “inaccessible boot device” or a black monitor screen, because the HDD and the video card are succumbing to out-of-specification CPU front-side-bus frequencies. Officially, or according to the Intel 845E chipset specification, an i845E chipset based board should be used with either PC1600 (2 x 100 MHz) or PC2100 (2 x 133 MHz). The IT7 Max 2 user however does not have to care about these “indications”. As already mentioned: the IT7 Max 2 BIOS offers the option to run the CPU and the memory asynchronous with a 3:4 ratio. 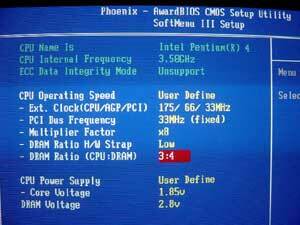 When the 3:4 BIOS option is enabled the CPU runs at 133 MHz and the memory at 177 MHz. In this case the RAM is even working at a higher frequency than PC2700/DDR 333 is asking for: 2 x 166 MHz = 333 MHz, versus 2 x 177 MHz = 344 MHz. Etestinglabs Content Creation and Business Winstone are system-level, application-based benchmarks that measure a PC's overall performance when running Windows-based, 32-bit, content creation and business applications. These benchmarks are a much better indicator for overall system performance than 3DMark 2001 which is mainly benchmarking the board’s graphic subsystem. The same goes for Unreal Tournament II 2003. It’s one of the first to take full advantage of DX8, but it’s basically testing the video subsystem - meaning, the video card. We ran our first benchmarking round with stock settings to get a base line for the following overclocking attempts. The IT7 Max 2 was running at 20 x 133 MHz = 2660 MHz with the CPU:RAM ratio set to 3:4. The Twinmos PC 3200 with Winbond DDR 400 5 ns chips was set to CL 2.0. For comparison purposes we also show results with an AMD XP 2200+ running the same tests on a KT333 board, the A7V333. We also include the results of our BD7-II article as the IT7 Max 2 and the BD7-II are based on the same 845E chipset. The results don’t surprise: The IT7 Max 2 with a P4 2.66 is naturally far ahead of an XP 2200+. The benchmarks show also (as expected) a good lead over the BD7-II with the same 845E chipset but with the lower clocked P4 2.26. In reality, however, the difference between a P4 2.26 and P4 2.66 is not noticeable. During our tests we found that the IT7 Max 2 is slightly undervolting the CPU. When the CPU voltage is set to default we should see a reading of 1.525 volt in the BIOS, which is the default voltage for the P4 2.66. Instead we got 1.50 volt. Many users have already reported this phenomenon with their IT7 Max 2 and IT7-I. We don’t know whether this is really an issue, because there was no impact on stability or overclocking. Maybe it’s only a BIOS misreading. The voltage however was very stable, we did not observe the huge fluctuations reported from some other Pentium 4 mainboards. 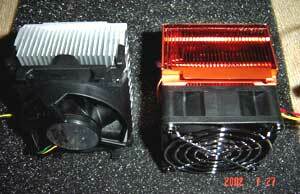 The Intel stock heatsink is a very capable device and good for up to 3000 MHz. But as we were aiming at CPU frequencies far above 3000 MHz, we decided to replace the Intel heatsink right away with the all-copper heat pipe based Cooler Master IHC-H71 with a 6,000 rpm/46 CFM fan. Keeping the 3:4 ratio, we then started increasing the FSB ( and by this automatically the RAM frequency) until we reached FSB 167 MHz / RAM 222 MHz. At this RAM frequency and still running the Twinmos PC 3200/Winbond DDR 400 at CL 2.0 we got an astonishing Sandra bandwidth of around 3400 MB/sec. This puts the IT7 Max 2 on the same bandwidth level with RDRAM PC 800. Naturally the 3Dmark 2001 score soared and we came with our GF3 TI500 close to the 11,000 mark in default settings. Content Creation 2002 and Business Winstone 2001 showed even bigger performance jumps. The later benchmarks are a much better indicator for overall systems performance than 3Dmark 2001 which is simulating only a gaming environment and mainly benchmarking the boards graphic subsystem. We then scaled the CPU/RAM ratio back from 3:4 to 1:1 and tried to increase the FSB further only to find out that 20x 167 MHz = 3340 MHz was the air-cooled maximum for our P4 2.66. Even lowering the RAM timings to least aggressive did not help: 3340 MHz was the maximum this P4/IT7 Max 2 combo delivered at 1.68 volt. As a start: not bad at all! We then applied the well-known P4 pin wire mod, as explained here. This let us increase the CPU voltage from 1.68 to 1.85 and worked like a shot in the arm: It let us push the FSB frequency up to 20 x 170 MHz = 3400 MHz. In order to run our entire benchmarks 100% stable we had to scale back though to 3280 MHz. This is an amazing result for an air-cooled system. The results at 3280 MHz when running FSB:RAM asynchronous at 164:219 MHz are shown in the tables on the next page. This is 620 MHz above stock frequency speed and we can see a very substantial impact on applications. Content Creation and Business Winstone both gained up to 20%! Naturally the more video card driven scores in 3Dmark 2001 and UT II 2K3 gained less, but still a healthy 10%. These results show that the P4 has still a lot of potential and what performance gains we can expect from the upcoming 3.02 and 3.2 GHz P4 varieties. Depending on the application and type of job on hand we feel it is more beneficial to run the IT7 Max 2 (and probably any other 845E board) asynchronous at 3:4 and a lower CPU frequency than going for a higher CPU frequency and running CPU and RAM synchronous at 1:1. The much higher bandwidth when running CPU:RAM at 3:4 is providing better overall system performance than with a higher clocked CPU at 1:1. This will for all P4 below 2.66 GHz not provide for the maximum possible CPU frequency but better overall system performance through higher bandwidth. We noticed that the IT7 Max 2 Northbridge was becoming very hot during our overclocking attempts. We therefore decided to install a bracket cooler with a 120 mm Papst fan moving around 110 CFM at 3,200 rpm. This way we kept the Northbridge and other vital parts like RAM, mosfets, and capacitors and of course the video card close to room temperature. We recommend to have a watchful eye on the Northbridge temperature when going into high overclocking. The passive IT7 Max 2 Northbridge cooling is easily overcharged when the CPU is running at FSB frequencies in access of 160 MHz without a fan. This is not to blame on ABIT or the IT7 Max 2, because at 160 MHz the CPU and the board are already running far out of their specifications.